Cisco Network Diagrams use Cisco network symbols to visualize the computer networks topology and equipment connections and arrangement. They are used by IT professionals and corporate IT departments, network and system administrators to visually document the topology and design of Cisco networks. Cisco has its own brand of network diagram icons. Cisco symbols are depicting network equipment, and connections lines where their style specifies the physical connection type. A Cloud icon represents the connection between external and internal networks without determining of outside network structure. If the same LAN designed with several appliances like PCs, a server and they connected to a switch and further connected to a router, which is linked to the Internet through the WAN. Various network diagrams may be depicted, for a LAN level with personal nodes or single physical devices, hubs or servers. ConceptDraw network diagramming software works across any platform, meaning you never have to worry about compatibility again. ConceptDraw DIAGRAM allows you to make Cisco network diagrams on PC or macOS operating systems. ConceptDraw has 1004 vector stencils in the 40 libraries that helps you to start using software for designing your own Network Diagrams. 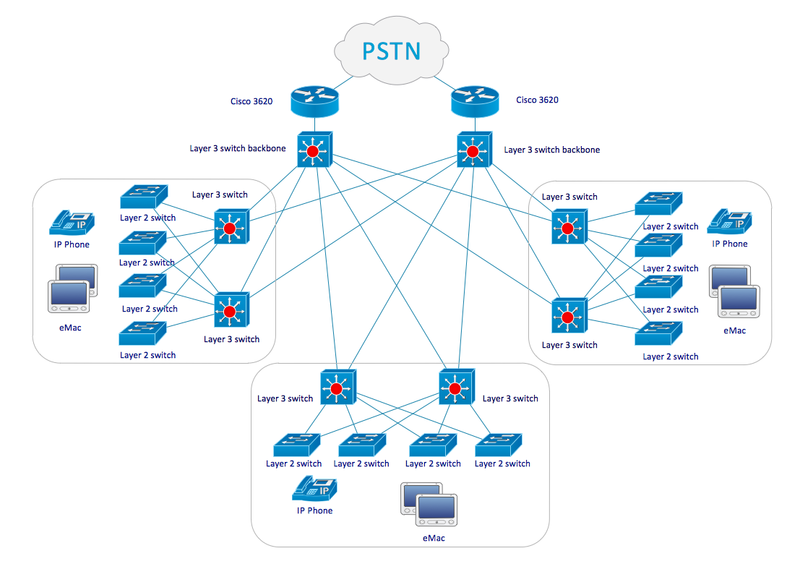 You can use the appropriate stencils from Cisco Switches & Hubs library with 26 objects. 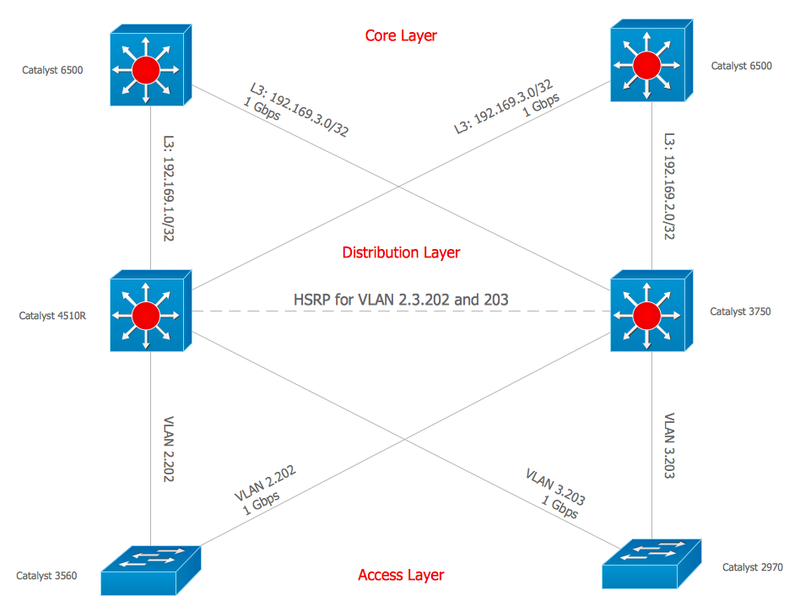 Use these libraries of design elements to visualize topology and design of Cisco networks. 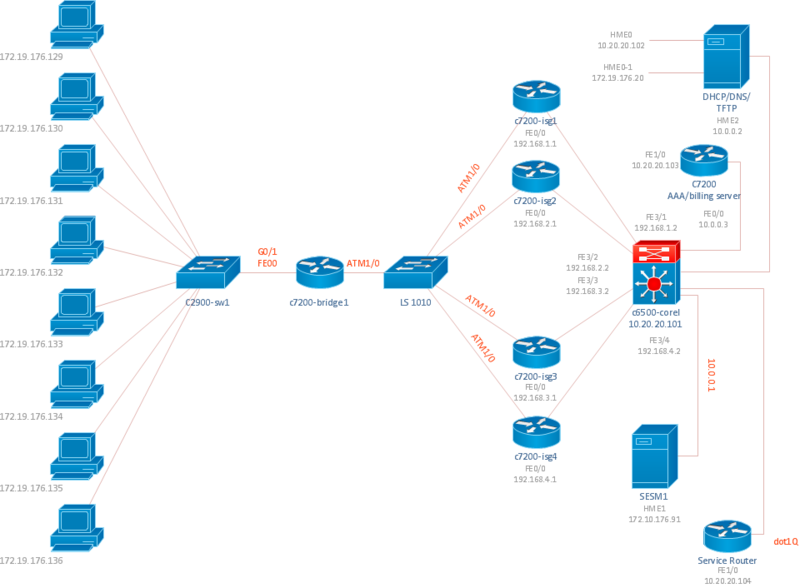 The example depicts a network topology built using Cisco Express Forwarding (CEF) technology. This switching technology is used in large core networks or over the Internet to enhance the overall network performance. 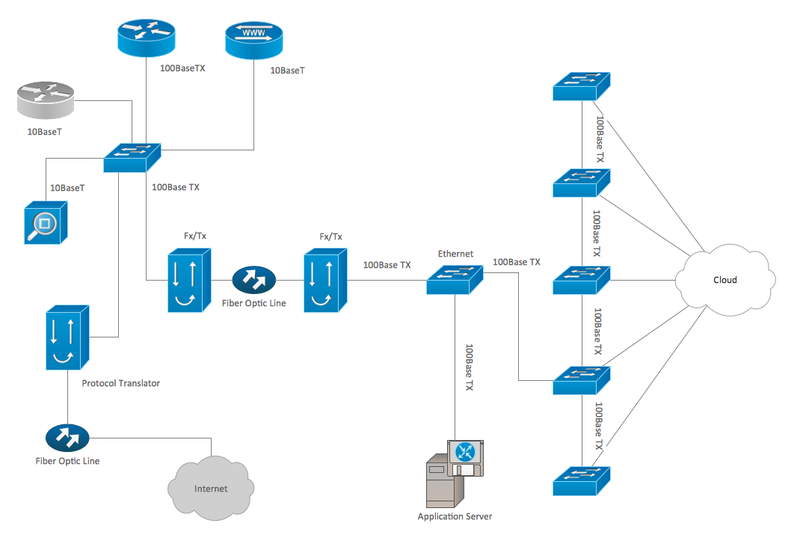 The network topology depicted in this sample was built using the Cisco Intelligent Services Gateway (ISG). Using predesigned Cisco icons from the libraries listed above you can produce complex network diagrams that adhere to the accepted standards of Cisco drawings. This sample shows a diagram depicting a LAN fault-tolerance system. Using ConceptDraw libraries you can access a wide array of Cisco network icons, so you can quickly prototype a new network or document an existing one. A network organization chart can be a great start for detailed network documentation, as well as serve as a visual instruction for new IT staff, or as a detailed illustration for a presentation. With ConceptDraw, you can create your own in minutes. 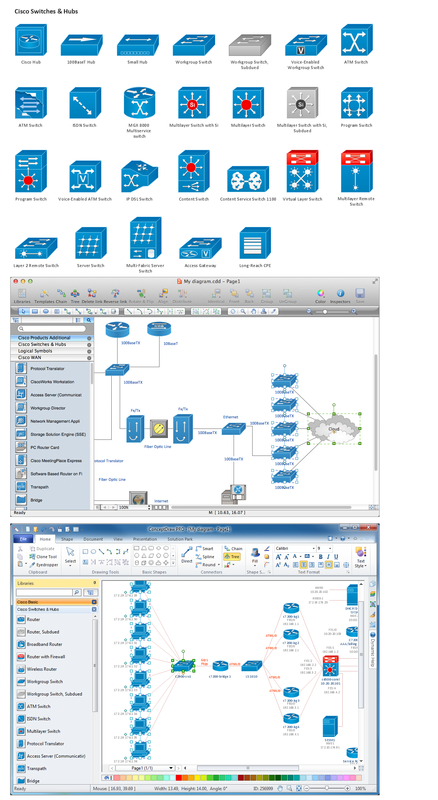 ConceptDraw DIAGRAM v12 is perfect for software designers and software developers who need to draw Cisco Network Diagrams.